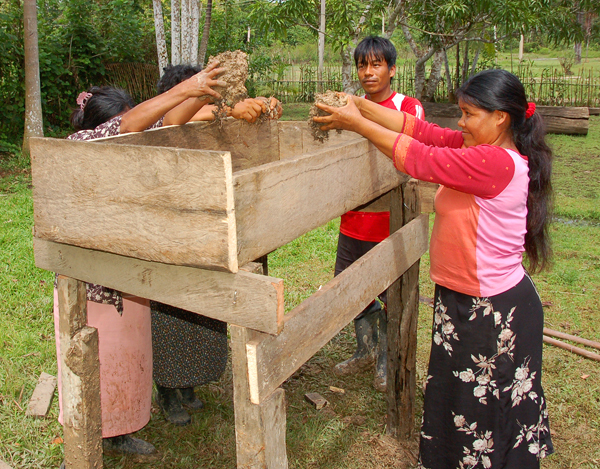 Residents of the Bora native community of Brillo Nuevo are used to the Yaguasyacu River flooding for a few months during the rainy season that coincides with the winter months in North America. 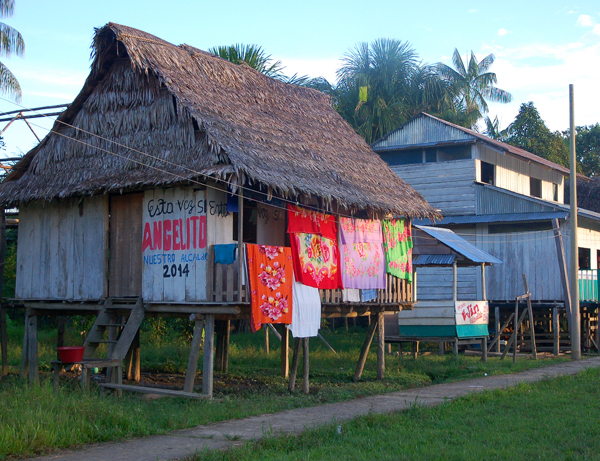 Families who live in the lowest parts of the village build their house on stilts and are used to visiting each other in their canoes during such times. In the past two years, though, the Amazon River and all of its tributaries have raised higher and inundated villages along its banks for longer. There are various theories about the cause for these increases, but it is clear these severe floods have harshly impacted the lives of thousands of people. 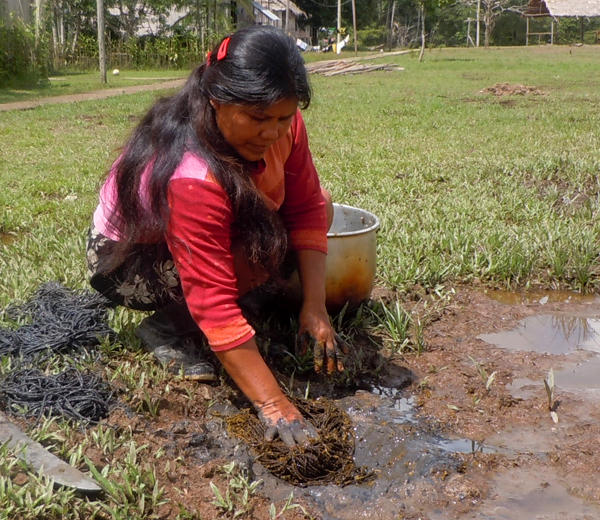 In Brillo Nuevo, these super floods have killed or stunted the growth of many of the plants that artisans grow in their backyard gardens to dye chambira plant fibers that are woven into hammocks, bags and other handicrafts – a prime source of income for many families. 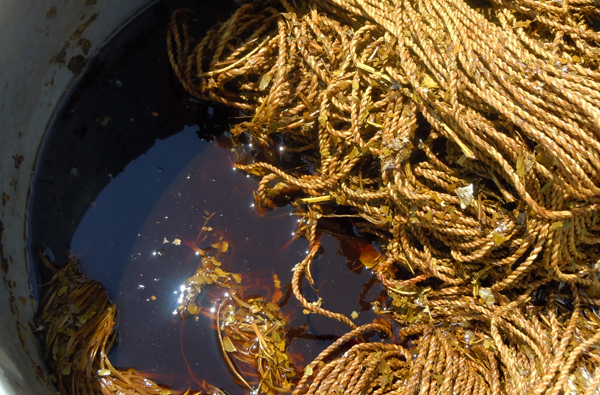 This summer CACE helped a group of artisans create a collective dye plant garden in a higher part of the village so some of the most common dye plants would continue to be available even if high floods return. While some families make planter boxes to raise common medicinal and cooking herbs next to their homes, we wanted to see if it would be possible to also raise the dye plant “guisador” (Curcuma longa) in an elevated box as well. Guisador is a member of the ginger family (Zingiberaceae) whose rhizomes are periodically harvested and ground up to dye chambira (or sometimes food) a deep yellow. One of the artisans told us she had tried this before without good result, but we wanted to try again with a design we thought would give the herb enough room to thrive. Artisan Lucila Flores Flores volunteered to work with us to try. On a Friday morning, three people from CACE and two other artisans showed up at Lucila’s house to launch this low-budget experiment. 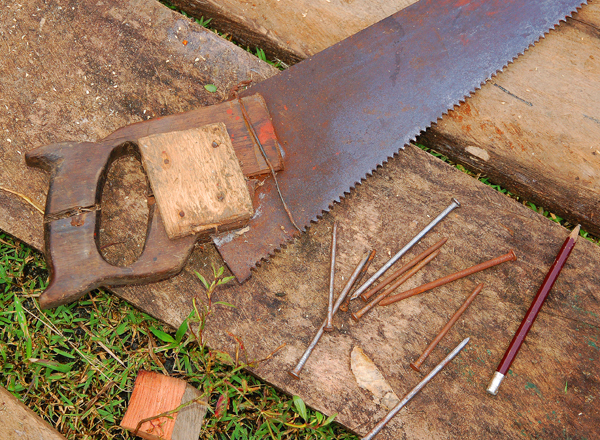 Our local project coordinator Javier helped Lucila scavenge some old boards and posts from her yard. He then pulled out and straightened the old nails from these to reuse while CACE project manager Yully Rojas got a handful of others left over from construction of the community pharmacy. The pair then marked up the lengths and widths of each piece which Javier cut to the desired dimensions with a saw held together with a wooden patch, nails and wire. 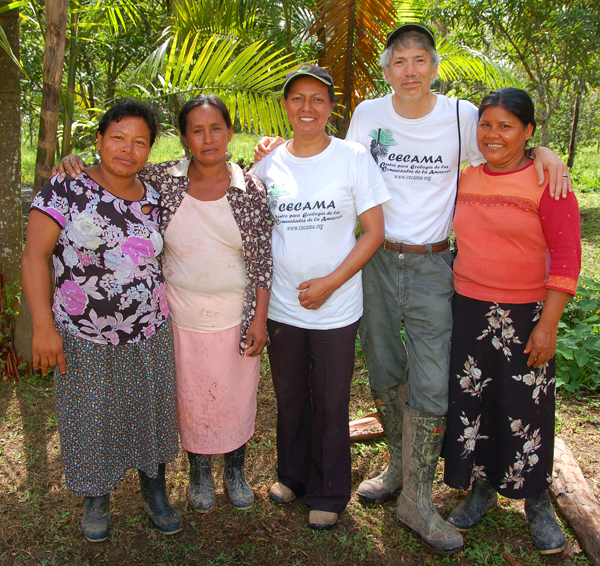 Fellow artisans Hilda and Ines took turns using a post-hole digger borrowed from one of the men who had last used it to plant rosewood seedlings in February thanks to our NGO partner Camino Verde and its director (and CACE advisor) Robin van Loon. As the planter box took shape, a large blue-morpho butterfly made several passes through the yard. 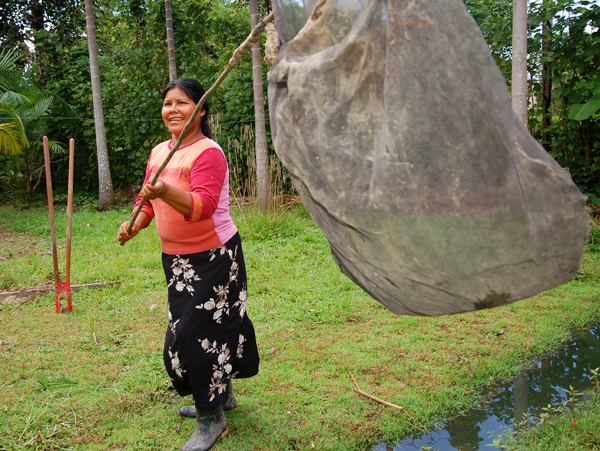 Lucila darted into her house and came back with a large net on a pole and waved it around numerous times, but she failed to capture the swooping blue beauty. 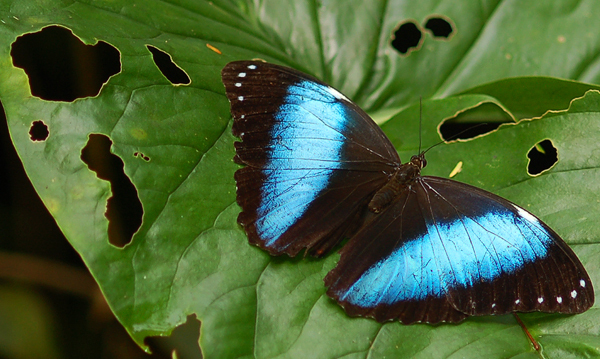 In the past she had made some extra cash selling several kinds of butterflies to a buyer from Iquitos. When the box was firmly attached to its sturdy posts about four feet off the ground, the team filled the inside with soil and mud. 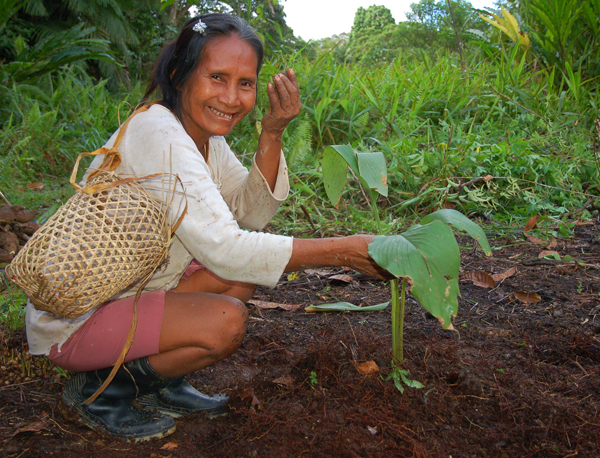 Lucila would plant little nubs of guisador root in it later with hopes of raising a regular crop of this essential dye plant. Suelda con suelda is a member of the plant family Loranthaceae – popularly known as the “mistletoe” family. 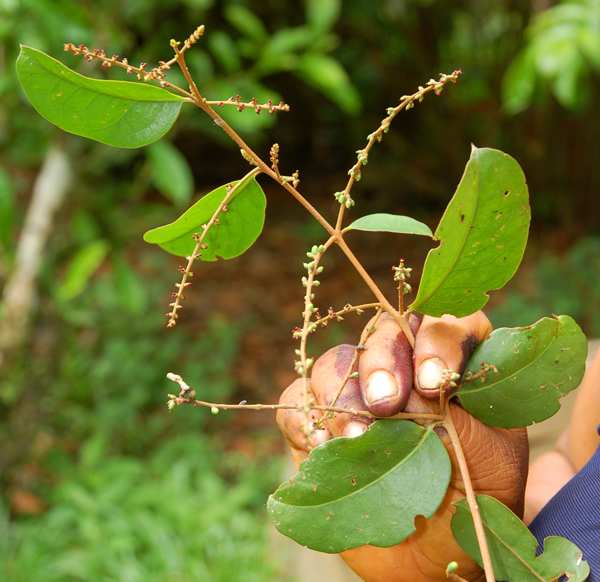 It is a thin vine-like parasitic plant that not only winds around the leaves and branches of its host – it actually penetrates its woody tissue to draw off some of its host’s nutrients. This species is likely Phthirusa adunca, although this common name is also used to refer to its relative Phoradendron spp. Some Bora families introduce the plant into their backyard citrus trees or least tolerate its presence so they can have it available as a source of medicine (used treating joint pain and other ailments), but they have to keep it under control or it can overwhelm its host and spread through bird dispersal of its seeds. 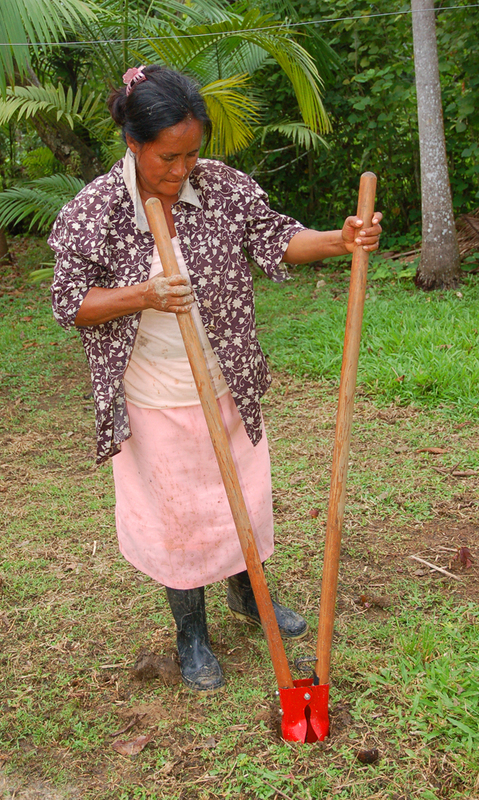 While it is not a primary dye plant, some artisans use the leaves of suelda con suelda to dye chambira fiber a light greenish brown. 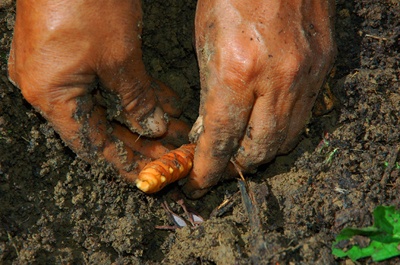 If the dyed plant is then mixed with the right kind of mud, the color of the fiber turns almost black. 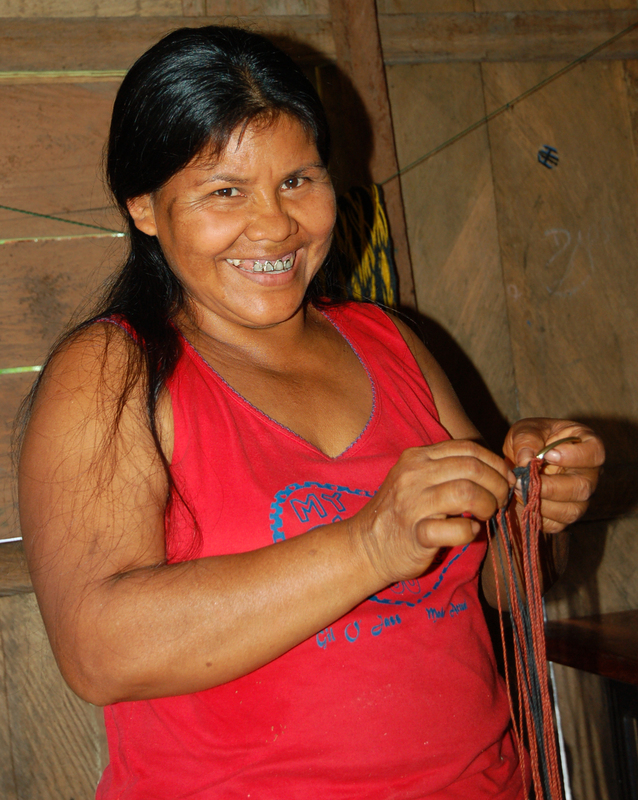 I look forward to seeing more crafts made by this talented artisan who is always smiling.